Old Gostiny Dvor – the oldest courtyard of Moscow. It occupies a small quarter of Kitay-gorod between Varvarka and Ilinka streets. The area where the Old Gostiniy Dvor located, has become an important center of trade in the XV century, when merchants settled there previously traded in the Kremlin. The first mentions about Gostiny Dvor was by Sigismund von Herberstein, who was in Moscow in the middle of the XVI century . : “Near the fortress there is a large, walled house, called the court merchants, which merchants live and store their goods.” Stone buildings were built in the 1590s. Construction was led by a wealthy merchant Averky Kirillov. In 1786 Catherine II ordered “Gostiniy Dvor to sell by parts with the obligation to bidders who wish to have a new built such as the square,” as it had already decayed, and there was the threat of a collapse of the building. The project of the new building was designed by Gvarengi, which has undergone some changes in the process of binding to the difficult terrain. Moscow architects not strictly monitor compliance with the project, and the owners have built a “very slow and uneven”. Construction continued from 1791 to 1805 year. The building damaged by fire in 1812, but was rebuilt and completed in 1825-30 the years by O. Bove. Old Gostiny Dvor became the prototype for similar buildings in other cities, but its original look was broken due to external and internal arcades owned shops. 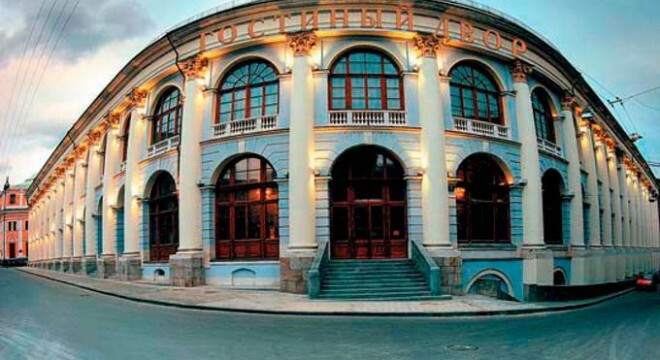 At the end of the period 1996-1999 were carried out work on the reconstruction and restoration of the building for use as a trade and exhibition center. As a result, it was seriously changed the face of Gostiny Dvor. According to the project of Russian architects have built over the building a massive loft, courtyard, closed the glass dome, and on the south wing have built two floors. The gallery lost the view of the St. Basil’s Cathedral. The dome changed view of Kitay-gorod, opens from the Big Moscow River Bridge.